OPEC quintupled its forecast for sales of plug-in EVs, and oil producers from Exxon Mobil Corp. to BP Plc also revised up their outlooks in the past year, according to a study by Bloomberg New Energy Finance released on Friday. The London-based researcher expects those cars to reduce oil demand 8 million barrels by 2040, more than the current combined production of Iran and Iraq. Growing popularity of EVs increases the risk that oil demand will stagnate in the decades ahead, raising questions about the more than $700 billion a year that’s flowing into fossil-fuel industries. While the oil producers’ outlook isn’t nearly as aggressive as BNEF’s, the numbers indicate an acceleration in the number of EVs likely to be in the global fleet. To see BNEF’s report comparing long-term EV adoption forecasts, click here. The International Energy Agency more than doubled its central forecast for EVs, raising its 2030 EV fleet size estimate from to 58 million from 23 million. Exxon Mobil boosted its 2040 estimate to about 100 million from 65 million. 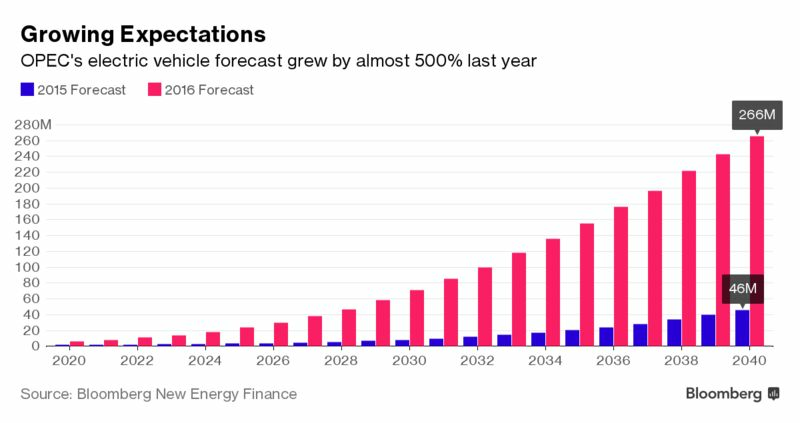 BP anticipates 100 million EVs on the road by 2035, a 40 percent increase in its outlook compared with a year ago. Statoil ASA, the Norwegian state oil company, says EVs will account for a 30 percent of new sales by 2030. Just a fraction of the world’s cars sold today are powered by batteries instead of gasoline. Many analysts increasingly say the market will expand rapidly as almost all major auto makers bring dozens of new EV models to market. OPEC said in its oil market report on Wednesday that electric vehicle sale targets could dampen demand in some parts of Asia as soon as 2018. Long-term growth depends on a wide range of factors, including policy decisions by governments seeking to tackle air pollution to the cost of the lithium-ion batteries that account for about a third of the cost of each one. Yet even as oil majors lift their outlook, they remain much less optimistic than the automakers. The world’s top automakers have a combined plan to sell 6 million EVs a year by 2025, rising to 8 million in 2030, according to Bloomberg New Energy Finance. Some big companies plan to go all electric. Volvo AB expects to have an electric motor in every car by 2019. It joins Elon Musk’s Tesla Inc. as a major EV maker and Geely Automobile Holdings Ltd., the Hong Kong-based maker of London’s black cabs, which is re-branding itself to focus on EVs.